A peek into my new morning routine looks a little something like swaddling Lola and putting her down for a nap, tip toeing across the room to shower and running around like a chicken with my head cut off trying to get ready while simultaneously praying she doesn’t wake up! I usually get about 30-45 mins to get ready these days and most days that’s a stretch. I decided it was time to treat myself to a little pampering, and I enlisted my friends at Parlor Blow Dry Bar in Cameron Village! If you have never had a Parlor blow out, you are missing out! I arrived to a glass of bubbly and left with the hair of my dreams (that I won’t have to wash for at least 5 days)! Parlor is the PERECT spot for new moms like myself. It was so great to not have to wash my own hair and have both hands free to take care of Lola. I was able to feed her right in the chair and still enjoy myself! The environment at Parlor was wonderful, and the stylists were so sweet to me and Lola. They even have a monthly membership that includes weekly blowout which I am seriously considering. It was seriously the best couple of hours and felt like a major treat to this momma! Can’t wait to book another blowout at Parlor soon. If you have been following me for any amount of time, you know my insane love for Steven Shell Living! I discovered Steven Shell while furniture shopping for our new home and have been a loyal shopper ever since. In fact, about 75% of the furniture in my home is from Steven Shell. It comes as no surprise that I would love their Christmas decor as much as I love their furniture and home decor. They have an incredible selection of the cutest baubles, ornaments, trees and festive adornments for your home! I stopped in to my local store (located in Cameron Village) and was incredibly inspired by this gorgeous tablescape! I love the mixture of the colorful trees with the varying heights of candles on top of a long runner. It would be so easy to re-create in your own home and would be perfect for the holidays! I also am dying for a few of the gingham tins with the whimsical trees to put on my mantle (OBSESSED). I always love adding a pop of red to my Christmas decorations. I can’t believe that we are just days away from Thanksgiving! If you’re anything like me, you’ll be filling your belly with lots of yummy food and filling your shopping carts with lots of amazing deals. Black Friday and Cyber Monday are two of my favorite days to score amazing deals on gifts for my family and friends. 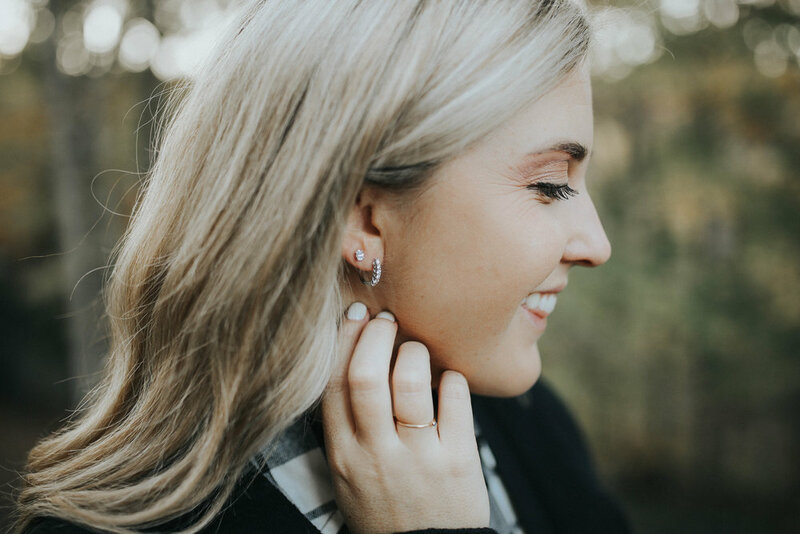 This year, I am so excited to partner with Blue Nile Diamond to share some awesome pieces from their Cyber Monday sale. Head here to see all of the amazing designs that are 50% off! My beautiful mother and sister-in-law helped me model a few of my favorite pieces that would be great gifts for the special women in your life! After all, diamonds are a girls best friend and diamond earrings are the perfect present that will be sure to wow Her. My sister-in-law is wearing the Tessere Diamond Hoop Earrings. These perfect dainty hoops are made of fourteen carat gold and are one half carat in weight, and will add a touch of sparkle to any outfit. My mom is wearing the Oval Cut Diamond Stud Earrings, which are eighteen carat white gold and one half carat in weight. They are light-weight and great for everyday wear. I chose the Emerald Cut Diamond Stud Earrings to match my wedding ring. They are made of fourteen carat white gold and are one half carat in weight. Each of these earrings are 50% off as a part of Blue Nile Diamond’s Cyber Monday Sale. It’s the perfect time to purchase an exquisite piece of jewelry for your loved one this holiday season. By now, you guys all know that my favorite place to shop in the Triangle is the fabulous Cameron Village! It’s filled with the best boutiques and greatest restaurants in the area and a place that my family and I frequent. The other I day, I found myself in desperate need of a baby gift for a friend of mine. I had put off finding something til the day of the shower and needed to find something quick. I decided to head over to Cameron Village and stop into one of my favorite boutiques, The Local Squirrel. They have the best room filled with adorable baby clothes and gifts called “The Little Acorn Room.” I love that they have such a unique selection and I can always find something special. They carry everything from sweet outfits, to stuffed animals to teethers and blankets! They even carry a brand that’s near and dear to my heart Headbands Of Hope. Headbands Of Hope donates a headband to a child with cancer for every headband sold. I was able to find the perfect gift for my friend (and adorable onesie and matching headband) and give back at the same time! Stop by The Local Squirrel and check out The Little Acorn Room for all your baby needs today.